Last week, in a medium-sized room at the UK Houses of Parliament, the MP Tanmanjeet Singh Dhesi hosted the launch of a new initiative by the Sikh educational charity, Basics of Sikhi. Britain is about to unveil new legislation on the carrying of weapons and for British Sikh groups it was vital it included an exemption for initiated (Khalsa) Sikhs and the Kirpans they carry. Basics of Sikhi had been developing a leaflet (PDF) to inform ordinary members of the public about the Kirpan and why it was important for initiated Sikhs to wear one. It was also part of a lobbying effort to get lawmakers to understand Sikh concerns. Both the Sikh MPs, Tan Dhesi and Preet Gill, and the Sikh peer Lord Singh, have lobbied on the issue in Parliament. The BoS leaflet says: "The Kirpan is part of the Panj Kakkar (5 Ks) uniform that all initiated Sikhs are required to wear. Pronounced ‘kir-paan’. 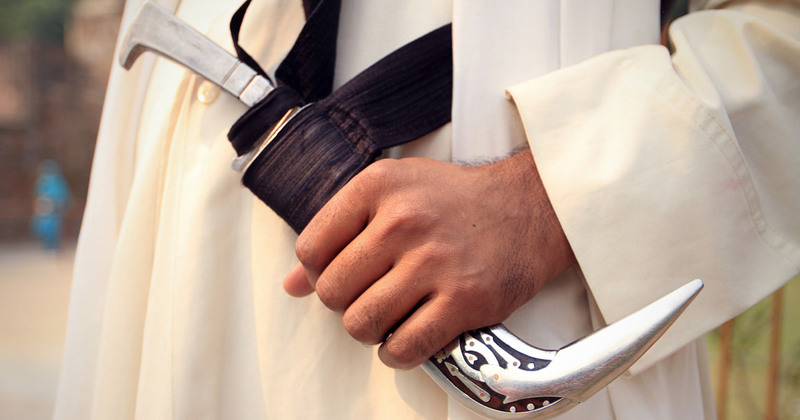 The word 'Kirpan' translates to Mercy (kirpa) & Honour (aan). "It is carried by all initiated Sikhs and represents a solemn obligation to uphold the safety of humankind. Initiated Sikhs are expected to be Saint-Soldiers, embodying spiritual qualities while battling injustices in the world." The leaflet was also endorsed by the National Sikh Police Association, a new body representing Sikh officers and staff throughout the UK, which will officially launch in Birmingham later this week. The Kirpan issue will also be addressed at launch. British Sikhs say they still encounter hostility and confusion when travelling with their Kirpans. Jagmeet Singh, a volunteer at Basics of Sikhi, said he was recently stopped and questioned at Gatwick Airport when he came to pick up his family. Other Sikhs have similar stories (video below). British Canadian leader Jagmeet Singh also carries a Kirpan. British law currently allows knives to be carried for religious reasons. But given the upcoming Offensive Weapons Bill, British Sikh groups want to ensure a special provision is made for Sikhs so they don't keep facing uncertainty and hostility. In November last year the Home Office stated they had engaged with Sikhs on the issue. "As a result, we have amended the Bill to ensure that the possession and supply of large kirpans for religious reasons can continue," said a spokesperson. But getting the law changed is only a small part of the equation say Sikhs. The public also need to be educated on the issue. To reach ordinary people, Basics of Sikhi have taken to the streets to speak to them directly, as they have always done. The new leaflet is an important part of that outreach.